Tezcatlipoca in Mesoamerican history is is also known as the GOD Enlil in Mesopotamian history with a connection to Anu/An whom are most likely one and the same GODs given the horned cap is the only symbolism of these GODs and this GOD does wear a horned cap or horned archers hat which explains the Deities with the bow and arrows, in Japanese history he was known as a Karasu Tengu or as Tien Kou the Celestial Dog in China as well as the Phoenix. Satan #2, Lucifer, Samael 2, Beelzulbul to Christians/Catholics. 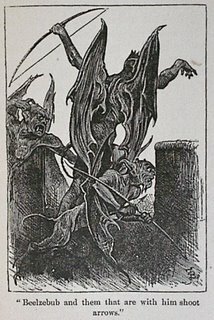 Beelzebub, Ba‘al Zebûb or Baal to the Philistines, Canaanites, Ekron and Semites. 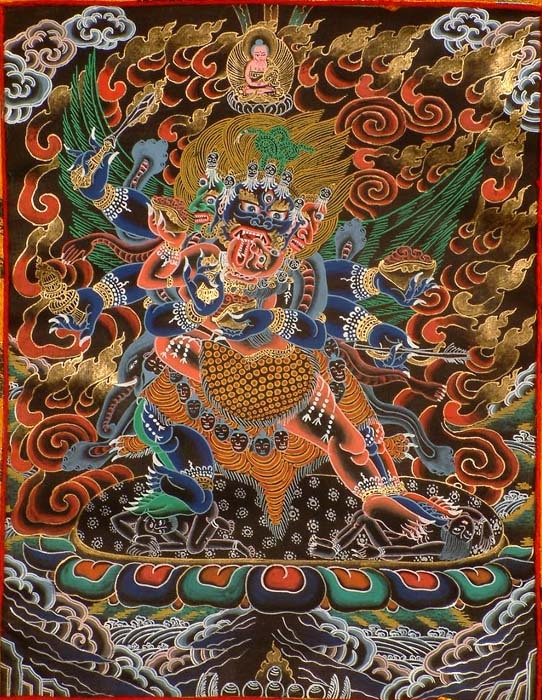 Bishamonten/Tamonten(painting)/Daikoku was the Black God, Native American Navajos home of the black GOD was the Pleiades or Black Serpent and the Hopi were "The Children of the Feather" referring to the entity with the feather in his hat. Osiris is a dark god claimed to have been killed but Ra has similar features with a red disk above his head in many depictions which represents the "RED UFO". There is Kali the Demon in Kali Yuga, Kali the female black GODDESS whom shares characteristics in stories of Tezcatlipoca and Karasu Tengu and may be the female counterpart to the GOD mentioned above and in Norse mythology the svartálfar "black elves" or "dökkálfar "dark elves" are supernatural beings that are said to reside in the underground world of Svarttalfheim, like the trolls, are often corollated with the dvergar or dwarves. 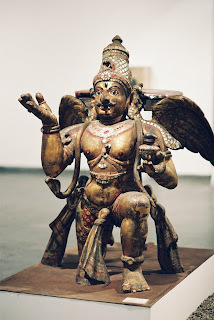 In one part of Hinduism he was known as Mahakala, then Kubera/Kuvera but in another part in Hinduism/Buddhism some have made associations of Garuda or Karura and Tengu being the same the wooden statues do resemble this GOD, besides being birdlike in references two statues of Karura does in fact have pointed ears similar to the God being described by me but one statues color was originally yellow instead of black. Yellow may have represented illumination or the color of the craft they fly which can be yellow/golden. 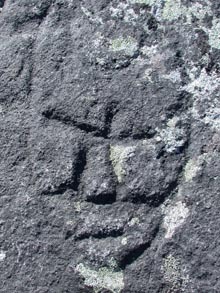 This GOD also shares a mythological history in the Qajartalik rock carvings. 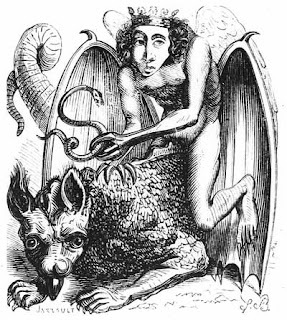 Abraxes has a few ancient and modern depictions. 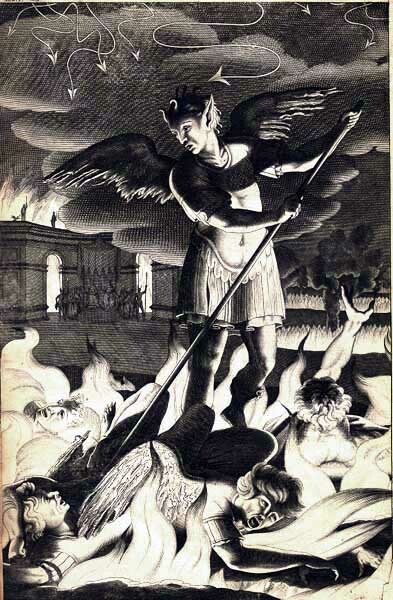 Yahweh, Enlil, and Tezacatlipoca were known to have destroyed there enemies or the wicked but then he was also very loving. I spent the night asking and Enlil was another answer they gave me besides the other names below, they are all the same GODS so love em'. The GODS gave me all this information and said go re-study history to see if it makes any sense and as questions arise that are confusing for me they answer them just like those paintings from ancient history of UFOs shining lights down onto our favorite religious super heroes, it's a fact and my friend is in reality adjustment. If they didn't operate similar to ancient history in communicating it wouldn't at all make logical sense since myths made absolutely no sense prior to Feb.-06. 1/07 We can thank the Christians/Catholics for all the negative connotations and paintings. This entity/Angel/GOD/Demon/etc... was loved and worshipped in just about every other culture. 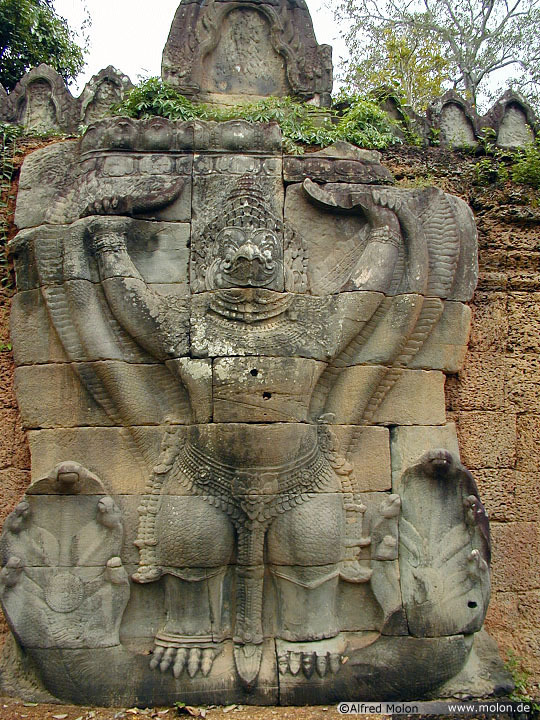 The Christians/Catholics can not blame it on Zarathushtra, the Babylonians, Coptic Gnostics or any other culture that used Satan, Shai-tan, etc.. for any reason due to the fact the entity is a good Angel specifically identified as the Serpent used differently from the original context of their religion with a dramatic story later that uses the religion itself to destroy the actual religion while covering up the truth breeding hatred which is apparent by the number of people that were killed over Satan 1 and 2 throughout history due to the latter story written by "The Roman Catholic Church" whom is responsible for the deaths of millions from the way the Bible was written and taught which demonizes their GOD/Angels and every other cultures in secrecy to the ignorant believers using them to destroy history. It also influences other beliefs to conform avoiding persecution which is evident by others that researched or knew of these beings, it also takes anyone that thinks these entities are bad and draws them into a fantasy world which degrades these Angels. Every depiction has close similarities but this GODs real appearance is way different then what is portrayed. The most interesting new image is Satan #1 as a partial Goat with what looks like a white outfit and then we have Satan #2, Lucifer #2, Beelzulbub whom has a large nose in a joker outfit with a hat that has a feather in it with what appears to be alchemist chemical lab equipment. 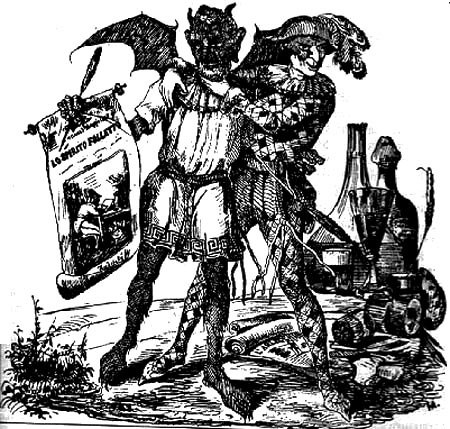 They tried to teach me something about the "elements" and they do joke around but they are good and not the "Evil Villains" portrayed by the very religious that worship GOD, Jesus was in contact with GOD, Satan/Serpent and Beelzulbub/Lucifer which coincides with other historical artifacts within their history and the world. 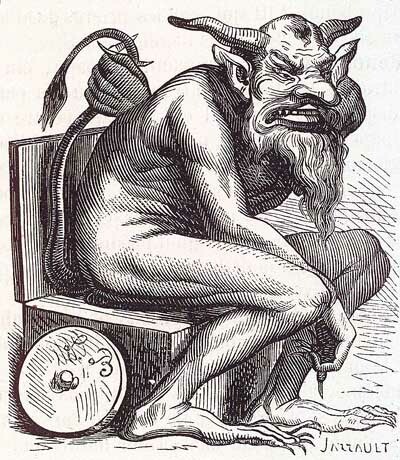 I wonder if the term "Scapegoat" came from the characterization of Satan as a goat. 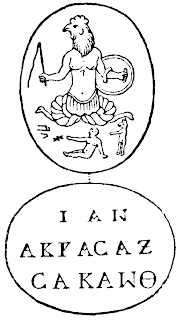 I am going to point out an interesting connection between the Mesoamerica Codex Zouche Nutall from Famsi.org and the Mesopotamian seal shown below it from xfact.com. 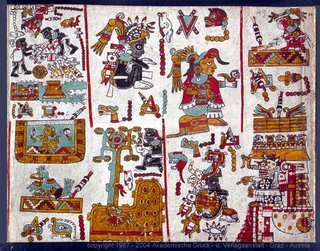 On the "Codex" we have a "Bird/human GOD/Deity with helpers working assuming on earth, doing what appears to be some animal mutilation as mentioned previously, a Deity speaking with another Deity and what almost looks like a "Tree of Life?" 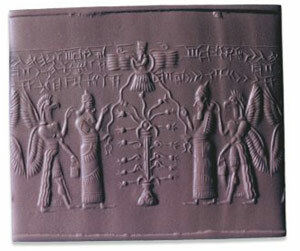 that is similar to some Sumerian seals. 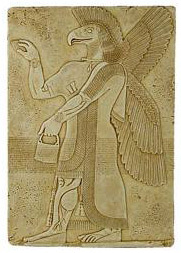 On the Mesopotamian "Seal" we have two different GODs one with a "Horned Cap Deity" and another "Bird Deity" around the "Tree of Life" with what looks like a cord attached to Sha-mesh. My interpretaion of this "Seal" like the "Codex" is that this is one of the "GODs that came down from the sky to help establish humanity, the cord to the "Winged disc" represents the connection to the "Sky GODs" falling from the sky guarding and tending to "The Tree of Life" as his job. 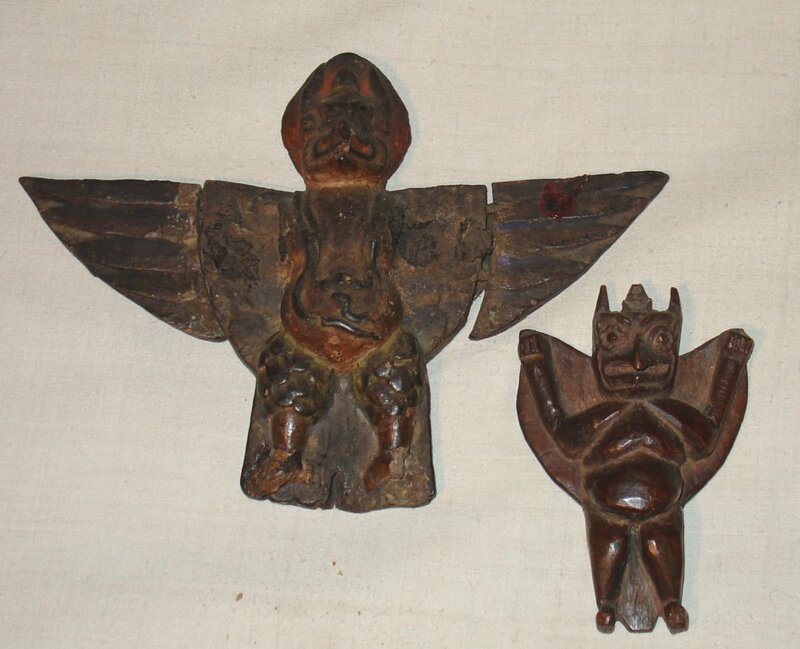 The GODs represented are most likely referring to that one specific GOD and used two representations to describe the GOD that similar to the Codex dressing up the GOD as a bird. 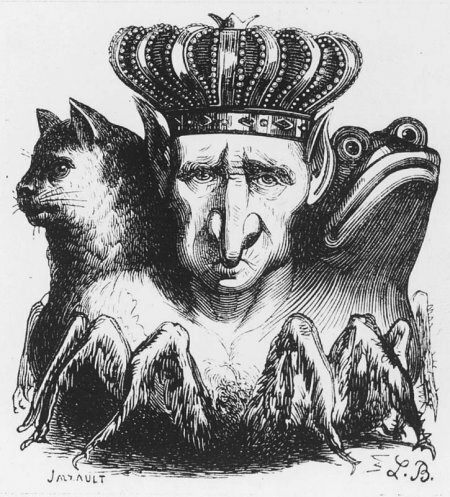 In a different "Seal" this same "Horned or Capped GOD" is a "Giant" among smaller humans which coincides with knowing for a fact they are giant size just like what is also described in the Bible. The Native American mask is red Tezcatlipoca. 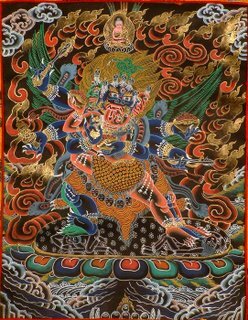 I have not been able to figure his GOD name in other because the depictions don't really match every culture has white, black, red or blue GODs etc.. associated with some part of life. 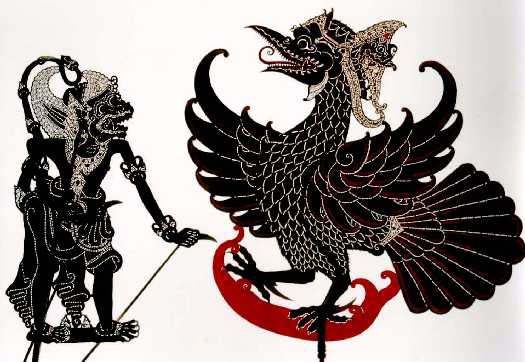 As mentioned in the previous post the Blue GODs are the Nordic blonds, the Black GOD is the GOD mentionesd in this blog, the Serpent/Dragon in white is in the previous post and the red Serpent is the Red Dragon or red Tezcatlipoca. I will let your logic and discernment of history decide if this is possible. 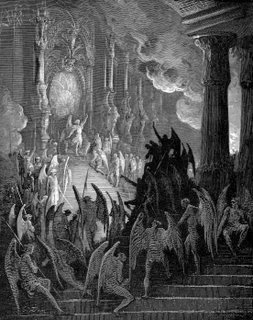 There was a big historical celestial event that occurred on the tenth day of the third month of year two thousand and six that is being denied but rewrote to have occurred on 3-8-06 that is discussed in the first post. On 3-10-06 around 7:30pm PST the stars Mizar and Alcor? lit up in the Big dipper simultaneously 10 seconds apart for 30 seconds each. A binary star system lit up simultaneously to reiterate that point and no mention of it was in the news even after contacting 20+ observatories(2 military my mistake) and this may be why, read on. 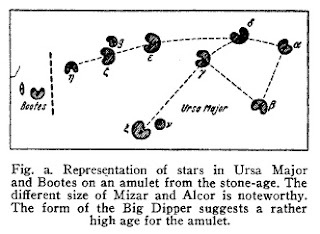 The tablet describes the appearance of different constellations and stars. On the 1st of Nisannu the Hired Man becomes visible. 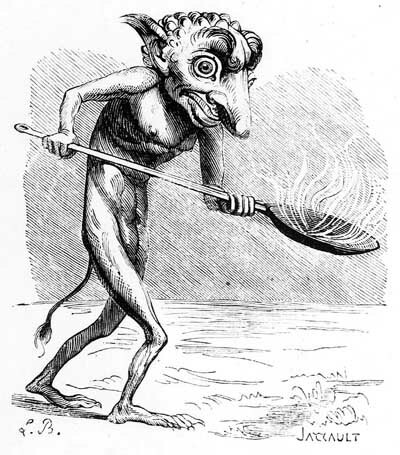 On the 20th of Nisannu the Crook becomes visible. On the 1st of Ayyaru the Stars become visible. On the 20th of Ayyaru the Jaw of the Bull becomes visible. 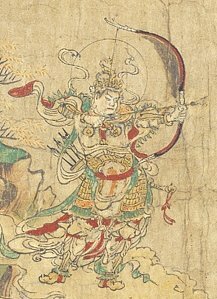 On the 10th of Simanu the True Shepherd of Anu and the Great Twins become visible. On the 5th of Du'uzu the Little Twins and the Crab become visible. On the 15th of Du'uzu the Arrow, the Snake, and the Lion become visble; 4 minas is a daytime watch, 2 minas is a nighttime watch. On the 5th of Abu the Bow and the King become visible. On the 10th of Ululu the star of Eridu and the Raven become visible. On the 15th of Ululu Shu-pa, Enlil, becomes visible. On the 25th of Ululu the Furrow becomes visible. 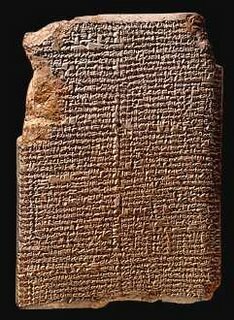 Simanu The third month of the Babylonian calendar, equivalent to May/June. http://www.mesopotamia.co.uk/astronomer/explore/mulapin1.html (Thank you). Is our calander the same as Babylonian?. Enlil will be known on the 15th of Ululu Shu-pa which most llikely is somewhere around 2011, 2012 or 2013 or just maybe sooner. If your a prophecy/omen person or astronomer take notes. 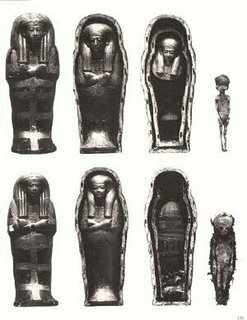 The tomb mummy ET photo has been around for quite a while and is what most people see at night when allowed if they do not allow you to see them then they can appear tall, gray/white in color, shadows during sleep paralysis, etc... 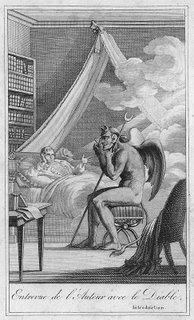 I went through a couple of periods of sleep paralysis and if they did not do that then most would have no clue when they come to visit, it's all part of them seeing if you accept their presence and if you do then you will experience no more sleep paralysis and they will wake you when they come. They can run very fast maybe around 50mph in one or two steps the exact speed can not be confirmed but lightning fast should explain it and they have super natural powers. The actually color of their skin is charcoal black which is the same color as their space suits. The leader is known as the GOD Tezcatlipoca or the black Tezcatlipoca from Meso-American history (He wears a black space suit with a green archers hat with feather and cape and has a normal size cranium in proportion to his body with gray herbivore teeth and a very large smile and eyes), The Dark Christ, The Wise Lord or The Persian God of Light, The Heavenly Father, YHWH/Lord/GOD-OT, (Enki&Enlil, one cursed vs. praising at the other and vice a versa causing variation-NT=CONFUSED ANCIENT PEOPLE LIKE NOW)(Their craft creates a pillar of fire upon descent stopping on a cloud(ionizing) the craft can change colors from red, yellow, white, black, blue, green, crescent shaped craft which had a glowing red front with yellow light or energy source on the tips, a cloud ionizing during the day with a clear ring inside. I have seen twice a red and yellow pillar of fire when these craft descend. 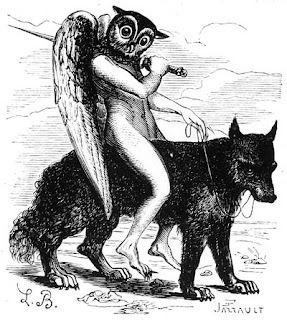 The GODS have a duality they can express towards humans so be good(read Hermes). 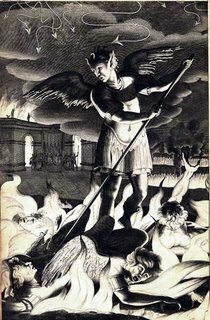 Modern day Christians refer Tezcatlipoca as a Demon because of his pointed ears but then praise Quetzacoatl when being visited by a large white figure with an illuminated head(This latter information was obtained from Evangelical or modern day Christian websites). Codex Zouche-Nuttal has 3 unique characters. The GOD in black and two other helpers in black have circular black eyes found only in these codex there are other Codex's but this one was unique and the helpers appear to be doing some type of medical experiment or mutilation by the UFO community, this does not mean UFOs do cattle mutilations since a rancher caught a black ops helicopter doing what are called modern day "Cattle Mutilations". 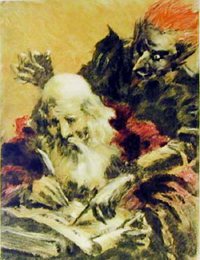 The codexes show various GODS written by human kind long ago some of the codexes have been partially deciphered but those scholars have not added in who the GODS are or if they are still on Earth. 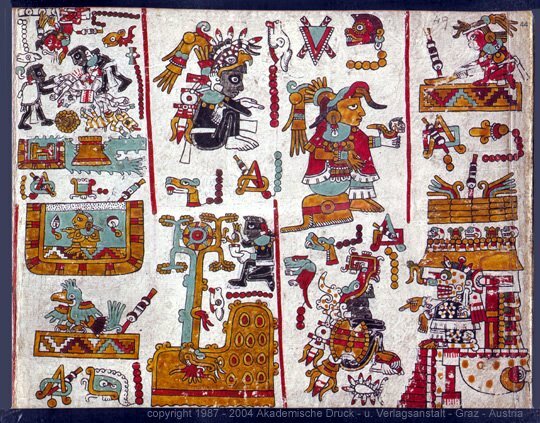 On the Codex Tezcatlipoca is draped in a bird outfit with a birds beak above his head on his attire which most likely represents his flight or coincidental appearance to a bird and cat with his ears or nose. 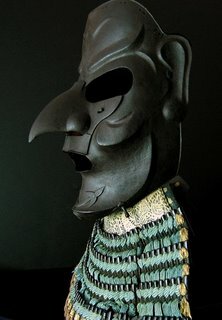 Tezcatlipoca was also known as a Karasu Tengu in Asian history or large nose(hooked or beak) gray to current UFO reports. 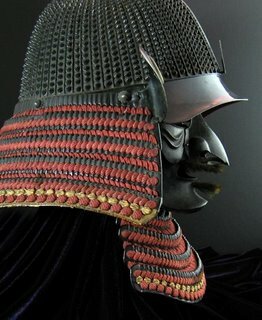 Karasu Tengu were bird like mountain goblin's. The Samurai's would wear a Karusa Tengu mask which looks almost exactly like Tezcatlipoca or the "Old Ones". The mask has almost identical wrinkles and nose structure coincidently, the behavior or story is similar to current UFO reports. I can personally verify some characteristics and behavior. He looks like a cross of Batman and the Green Goblin with a smile and is friendly to the good intentioned whom they reward. 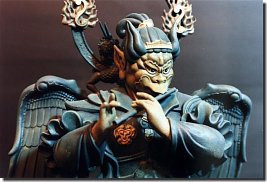 The Tetsu Sabiji Karasu Tengu Menpo is the first photo which shows facial outlines in detail just add some pointed ears and batman horns. 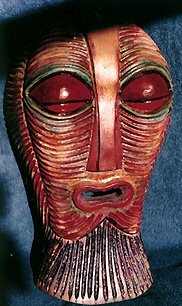 The reddish/biege/tan mask head is Native American and is very close in appearance previously mentioned in the Quetzacoatl post about the GOD that wears a red space suit with gold insignias. 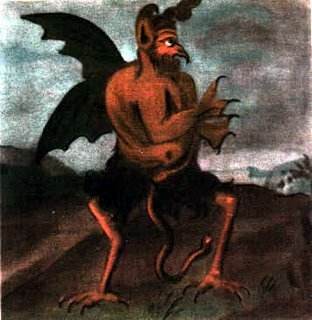 This may be the GOD that people see when describing a scaly brown entity but this should help clear up the myth of white, black or red Tezcatlipocas. 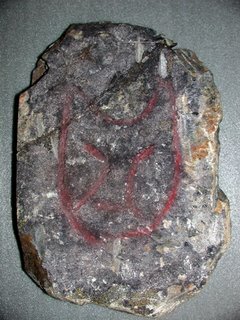 I am trying to relocate the rock formation made of Tezacatlipoca the Black GOD by an unknown culture that is very accurate in facial detail, the photo has not been seen in maybe 20+ years. The little Deities are actually cute when alive and are happy go-lucky entities. Anything dead especially human are very unattractive in appearance so do not judge a book by it's cover. The skin and partial eye color obviously changed when this entity ceased to live which occurs with many living species. This is proof that the Egyptions and Mesoamericans were in contact with GODS which are known as Extra-/Terrestrials or Aliens by the current human race. This does explain how the past cultures advanced and whom helped since we have a more historical information remaining that main stream science shrugs off as a myth or unproven. Most of these scientist say things like "Why don't they just land" and I say "Why don't you learn your history". Modern day humans need to thank these GODS/entities and others for our modern life that humans have not figured out spiritually or environmentally and connected this to our long lost ancestors. These GODS have been around since the dawn of time. All my experiences with them have been good to very good. If someone is having a negative experience then those people need to re-examine their lives and/or see if these entities are truly the source or was it something they read and saw on T.V./movies. 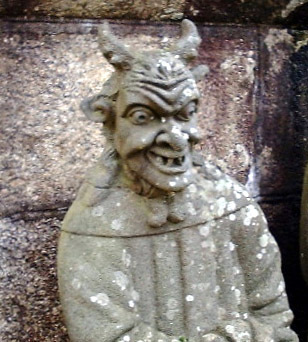 If you have a bad attitude in life as with most humans do not expect any favors, trash thinking in general will not benefit you spiritually or your visit so in short just be a genuine good person if you try to contact these GODS. The GODS or UFOs are responsible for life on Earth as documented in many cultures it is your free will to accept or deny historical truth.